The timber-framed houses in Vicars’ Close and the Cathedral Close in Lichfield are one of the hidden gems in the cathedral city, often unnoticed by tourists, and sometimes even unknown to people who have lived in Lichfield for decades. But Lichfield has about 50 other houses that are still standing and that still have part of their timber-framed structure. Generally, these are two-storey buildings or of two storey buildings with attics. Many of the street fronts in the centre of Lichfield, such as those in Market Street, Bore Street, Lombard Street and Greenhill, are jettied at each floor, and the roof lines are of continuous gables with ridges at the same level as that of the main roof. Most of the box-framed buildings probably date from the late 16th and early 17th century. The few houses with close studding, such as those in Vicars’ Close and 11 Lombard Street, or with cruck framing, such as 11 Greenhill, may be earlier than most of the box-framed buildings. In the past, there were two main types of timber buildings in England – the box frame construction, and cruck buildings. Box frame was a construction of mainly pre-fabricated sections that were made up, and then erected on the site to form the shell of the building, with the roof supported on beams carried on to the top plates – or wall plates on the upper frames, thus transmitting the roof load down to the ground through the framework below. The distribution of timber-framed buildings suggests that timber remained the usual walling material in Lichfield until the late 17th century, when it was displaced by brick. 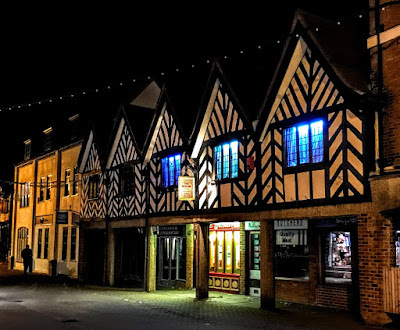 In many of the surviving houses in Lichfield, the gables either rise from just above the jetty, as at 11 and 13 Market Street, or the gables rest on a section of wall, as at 16 Market Street. Where the framing is exposed, the gables are usually the area of most elaborate decoration, in square panels with shaped braces. Several of these houses have herring-bone studding to the first floor, including Lichfield House, or the Tudor Café, and the building long known as Five Gables, both on Bore Street. The original framing on the ground floor has not survived in many of these houses, and where it has it is not decorated. During my latest visit to Lichfield within the past fortnight, as I walked along Bore Street on a clear winter’s night, both the Tudor Café and Five Gables looked resplendent in the glow of the evening lights. 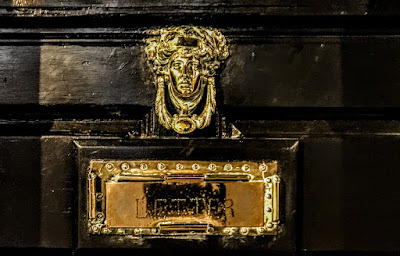 The Tudor of Lichfield at Lichfield House, 32 Bore Street – a ‘tea house with a history’ – is one of the places to which I enjoy bringing new visitors. 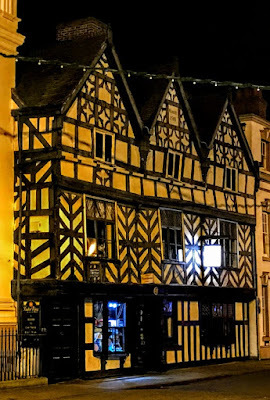 But, although Lichfield House is dated 1510, the year after Henry VIII succeeded as king, it probably dates from the late 16th century, with 18th century alterations and a 20th century connecting block. It is a timber-framed building with a brick rear range and wing. The tile roofs have enriched cresting and brick stacks. It is a three-storey, three-window range with and three gables, and it is jettied at the first and second floors. There is a bracketed upper jetty and enriched finials and end pendants to the gables. The entrance is to the left of the centre and has moulded posts to the jetty and a small-paned and fielded-panel half-glazed door. The passageway to Tudor Row is at the left end. The ground floor has two canted oriels; the oriel on the left has a four-pane sash, while the oriel to the right has 1:4:1 fixed lights with leaded glazing above the transom. The window to the right of the entrance has plate glass and leaded glazing above the transom. The first floor has three-light transomed windows with upper leaded glazing. The second floor has two-light casements with moulded frames. There is a large brick stack. The timber-framing has close studding on the ground floor, herring-bone bracing on the first floor and curved cusped braces below the second floor windows and at the gables. The rear of the house has brick platt bands and modillioned brick cornices, segmental-headed windows, some with pegged cross-casements. The rear wing, attached by a 20th century block, has a brick cornice and varied casement windows. Inside, the house has chamfered beams and joists. The ground floor has 17th century and early 18th century panelling, the open-well stair has turned balusters, square newels and a moulded handrail, and two lions to the landing. The rear wing has chamfered beams and joists. When the old glass houses were demolished, nine shops were built in 1980 as Tudor Row on the lines of the Shambles of York or the Lanes of Brighton. Later, the old coach house was developed into two further shops. This black-and-white, timber-framed building served as a prison during the English Civil War in the 1650s. It has been a family business since 1935, when the founders Wilfred and Evelyn Burns-Mace opened it as a tea shop. Today, as the Tudor, Lichfield House continues to offer morning coffees, lunches and afternoon teas, along with a range of specialty dairy ice creams. Further east along Bore Street, past Donegal House and the Guildhall, the Five Gables is a collection of late Tudor or early Jacobean houses, and now houses shops and a restaurant. It was built in late 16th century the early 17th century as a herringbone, timber-framed residence, with herringbone timber-framing, and Jacobean relief decoration to the wall post to the right of the central gable. This row of timber-framed buildings once included Hindley’s café and shop in Bore Street. Sadly, much of this old building was destroyed in extensive restorations and alterations the 1960s, when the bottom floor was cut away to form an arcaded walkway. Only the gables survive, now stuck to the front of a modern building, and the rear of the building has extensive 20th century additions. This is a timber-frame, two-storey building with a five-cross gable range with concrete and brick additions, and a renewed tile roof with five cross gables. The 20th century shop windows are recessed behind 20th concrete posts and beams. The windows on the first floor have three-light leaded casements. In the mid-1950s, many of the old timber-framed buildings were pulled down along Stowe Street, which is a continuation of Lombard Street and close to south side of Stowe Pool. 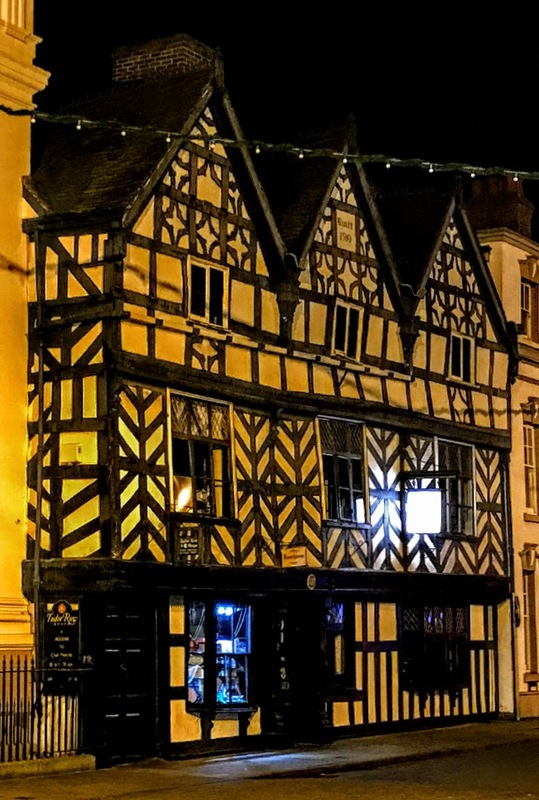 But Cruck House is a restored Grade II* timber-framed mediaeval cottage at 71 Stowe Street, and an impressive sight on Stowe Street in the midst of modern residential and commercial buildings.